NASA's Mars Exploration Rover Opportunity climbed out of "Victoria Crater" following the tracks it had made when it descended into the 800-meter-diameter (half-mile-diameter) bowl nearly a year earlier. PASADENA, Calif. -- NASA's Mars Exploration Rover Opportunity has climbed out of the large crater that it had been examining from the inside since last September. "The rover is back on flat ground," an engineer who drives it, Paolo Bellutta of NASA's Jet Propulsion Laboratory, announced to the mission's international team of scientists and engineers. "We're headed to the next adventure out on the plains of Meridiani," said JPL's John Callas, project manager for Opportunity and its twin Mars rover, Spirit. "We safely got into the crater, we completed our exploration there, and we safely got out. We were concerned that any wheel failure on our aging rover could have left us trapped inside the crater." The Opportunity mission has focused on Victoria Crater for more than half of the 55 months since the rover landed in the Meridiani Planum region of equatorial Mars. The crater spans about 800 meters (half a mile) in diameter and reveals rock layers that hold clues to environmental conditions of the area through an extended period when the rocks were formed and altered. 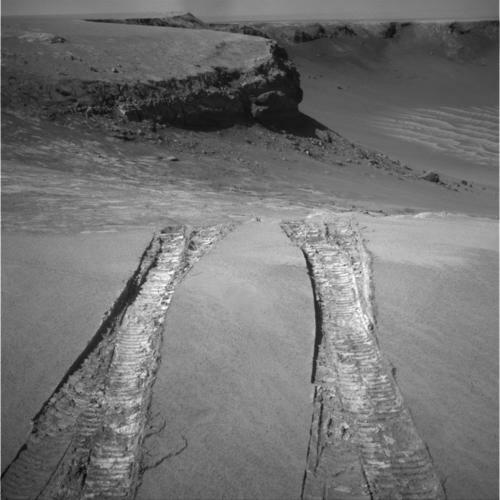 The team selected Victoria as the next major destination after Opportunity exited smaller Endurance Crater in late 2004. The ensuing 22-month traverse to Victoria included stopping for studies along the route and escaping from a sand trap. The rover first reached the rim of Victoria in September 2007. For nearly a year, it then explored partway around the rim, checking for the best entry route and examining from above the rock layers exposed in a series of promontories that punctuate the crater perimeter. Now that Opportunity has finished exploring Victoria Crater and returned to the surrounding plain, the rover team plans to use tools on the robotic arm in coming months to examine an assortment of cobbles -- rocks about fist-size and larger -- that may have been thrown from impacts that dug craters too distant for Opportunity to reach. JPL, a division of the California Institute of Technology, Pasadena, manages the rovers for the NASA Science Mission Directorate, Washington. 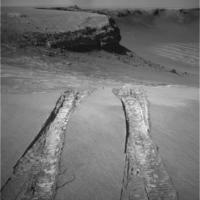 For images and information about NASA's Opportunity and Spirit Mars rovers, visit: http://marsrovers.jpl.nasa.gov/home/index.html.